An Agile thought leader discusses how Agile teams and product owners can scale up, and what the PO role looks like while working in a scaled Agile team. The labels “chief product owner” and “product line owner” are the ones I generally favor, but they are representative only; use others if you wish. In addition to these, I’ve seen both program owner, super product owner, area owner, and feature owner used successfully. On all projects, the product owner is torn between competing inward-facing and outward-facing needs. Among the inward-facing tasks are participating in planning meetings, Sprint Reviews, Sprint Retrospectives, and Daily Scrums; managing the product backlog; answering questions from the team; simply being available to the team during the Sprint. A chief product owner is responsible for having an overall vision of the entire product or product suite. The chief product owner conveys this to the entire team in whole-team meetings, e-mails, team get-togethers, and through whatever other means are available. Suppose, for example, we decide to develop an office productivity suite that will include a word processor, spreadsheet, presentation software, and personal database. Competing with Microsoft Office, Google Apps, and other products will be daunting, but our chief product owner is fearless. 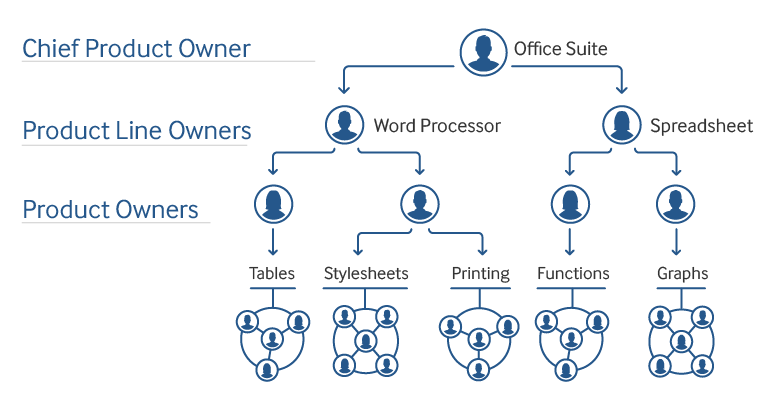 Because the chief product owner will be focused on strategic issues, competitive positioning and such, product line owners are selected to own the individual products in the suite—the word processor, spreadsheet, presentation program, and database. Each product line owner, in turn, identifies product owners who will be responsible for feature areas within the product. The product line owner for the word processor, for example, may work with one product owner who is responsible for tables, another responsible for stylesheets and printing, another who is responsible for the spell checker, and so on. Similarly, a product line owner will often want to stay involved in a more hands-on manner and will also work as one of the product owners. Perhaps our product line owner for the spreadsheet product also acts as the product owner for the team that will add charts to the spreadsheet product.